Scroll down to read more about their different styles. All our certificates are free for personal use. Parents tend to use them as an extra little something that the Tooth Fairy leaves behind when collecting a tooth. We hope you enjoy them. 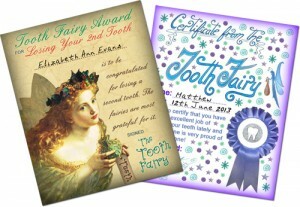 Modern Tooth Fairy Certificates are designed to look fresh and cheerful and are also a good choice if you don’t want to use too much ink. They are designed with both boys and girls in mind and cover a range of tooth-related occasions, from losing your first tooth to remembering to brush your teeth at Halloween. You may also like our Tooth Fairy notes, they’re of a similar style. 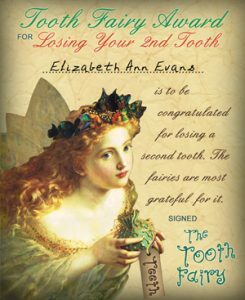 Vintage Tooth Fairy Certificates are designed to look full of old-fashioned magic. There’s one to collect for every one of the first ten teeth your child loses, which is a nice way to keep count. 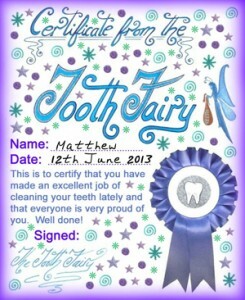 Parents tell us that this style of Tooth Fairy certificate is more popular with girls. You may also like our tooth and money envelopes. They’re for exchanging your child’s tooth with a coin – and making it look like magic.